Today while crossing the road I witnessed a rather uncommon road event known as a ‘shockwave traffic jam’. This occours when one car slows down for whatever reason, slowing the car behind it, slowing the car behind the second car and the car behind that one and so on and so forth. This eventually spawns this mass of stopped cars that moves backwards along the road at about 20kph. It moves like a shockwave hence it’s name. This is really well shown in an experiment set up by Japanese scientists below. Today I traded in my regular copy of BBC for the collector’s edition, or Gold Edition. the Gold version has a poster, bonus weapons and gameplay hint videos, plus a shiny gold-coloured metal game case. I got mine second hand for not much more than the normal games and the poster was not too tattered so I was happy with the upgrade. Unfortunately the game data is installed as a seperate file and is not added on if you have a pre-existing one, so I must re-do all the levels. I had hopes for this game, seeing as it’s one of the famous Resident Evil franchise, but it is honestly just another over-exploited piece of crap that you often see nowadays, like Sonic, Mario and Final Fantasy. The camera angle was not well thought out, with a very awkward camera angle that gives you a wonderful view of the floor. Also the is not nearly enough ammunition to survive and you end up cornered in a dead-end fending off zombies with nothing but a knife and stupid, stupid quicktime events. Also all the zombies seem to have grown cthulu tentacles that they use to try and eat your face off, plus the tentacles sprout from their necks with a killing headshot. The game doesn’t even adhere to standard zombie knowledge, with headshot against a fresh zombie simply causing them to slow down while they clutch their head. I suspect this is because there are supernatural forces holding these things together as there are flying-maggot things and a mini boss who looks like several corpses held together with lots of pins and holds a gigantic axe. None of this seems to be anything like the Resident Evil I know and love, with shuffling dead people and Tyrants and the T-virus. All the controls are horribly complicated, requiring you to press 2 buttons just to aim and another to shoot. This was also shown in Metal Gear Solid 4, unfortunately. The aforementioned camera angle doesn’t help either, making running down stairs a challenge in itself. Your default speed is walk and you need to hold X to move quickly. This hampers you when you must move quickly to cover your partner who is frequently split up from you and mobbed by zombies. A friend is pre-ordering Halo Wars and I look forward to playing it. I have heard that the graphics may or may not be brilliant, but the gameplay seems to be okay. More on this in 1-2 weeks time. This game excretes awesome from every pore. Even the title is cool. 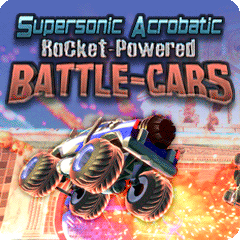 SARPBC is a car-soccer game with some slightly broken physics. You can drive up walls before launching yourself off with rocket boosters on the underside of your car and landing on and crushing another car while doing a barrel roll. Really, you can do that. Manipulation of the car in mid-air is easy, with square spinning the car laterally and the left analogue stick spinning it on a flat plane. Just zooming around the track at supersonic speeds with blue fire coming from your wheels is enough to warrant downloading the demo. Sadly, there is a stupid time limit of 1 hour and 30 minutes of game time built into it and this just ruins the whole experience. But with what time you do have you can play in all sorts of different-shaped soccer arenas with up to 4 people locally and many others online. 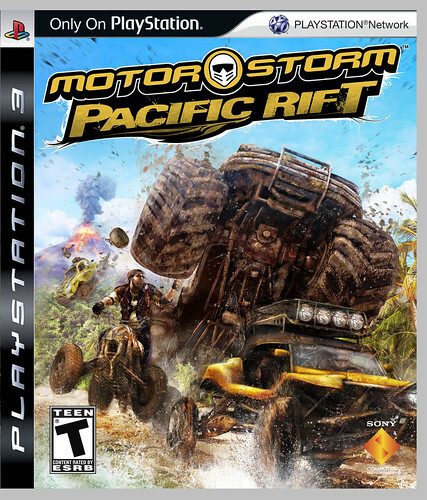 I own the first Motorstorm game and I must say Pacific Rift is an improvment over the original. The new, lush jungle-like setting is much better than the arid deserts of the first and there is the addition of the new water-cooling feature. Using the boost equipped to your vehicle increases the engine heat too. Use it too much, and you explode. But in the new game, if you drive in water your engine is cooled and you can boost much more than on dry land. Water seems to be featured prominently with water splash on the camera and spectacular jumps through waterfalls. A much-needed feature shown on the demo is a 2-player mode, letting you race against a friend. In the first Motorstorm you were restriced to 1 player only offline, bringing down the game somewhat. The video shown on finishing the only track in the demo shows tracks with lava, so maybe you can ride around volcanoes at some point. 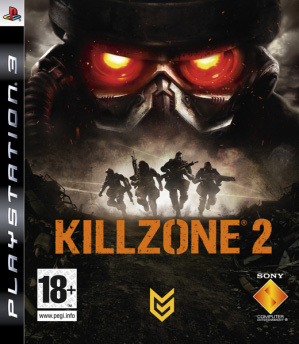 Tried the Killzone 2 demo over the Playastation Network. It’s a rather fun game which isn’t too challenging on the normal difficulty. Being a demo, it was woefully short and lacking in content but from what little I saw it looks like a pretty good game. I’m not familiar with the story, but it seems to be a human invasion of some sort of planet from a different dimension. The baddies are called the Helgast, and I wouldn’t be suprised if this alien dimension is a paralell one as there is some remarkably familliar Helghast techology. Their assault rifle looks like a FAMAS rifle with some shiny attachments, and they have gas bottles which look exactly like the ones you hook up to your barbeque. The gas bottles themselves are rather fun and useful. A single shot will produce a fuse like effect that spews out hot gas to the point the barrel explodes violently. This can be used to create traps for eneimies, setting off stockpiles of these things. The escaping gas can also propell the barrel around, moving it in a particular direction or just spinning it on the spot. The side-handgun has infinite ammo, making it rather broken and far too powerful. Grenades and a knife round out your arsenal, with the grenades producing light which handily illuminates where they have been making anticipating where it’s going to go much easier.